A visit by Glossy Black-Cockatoos is always a welcome treat. 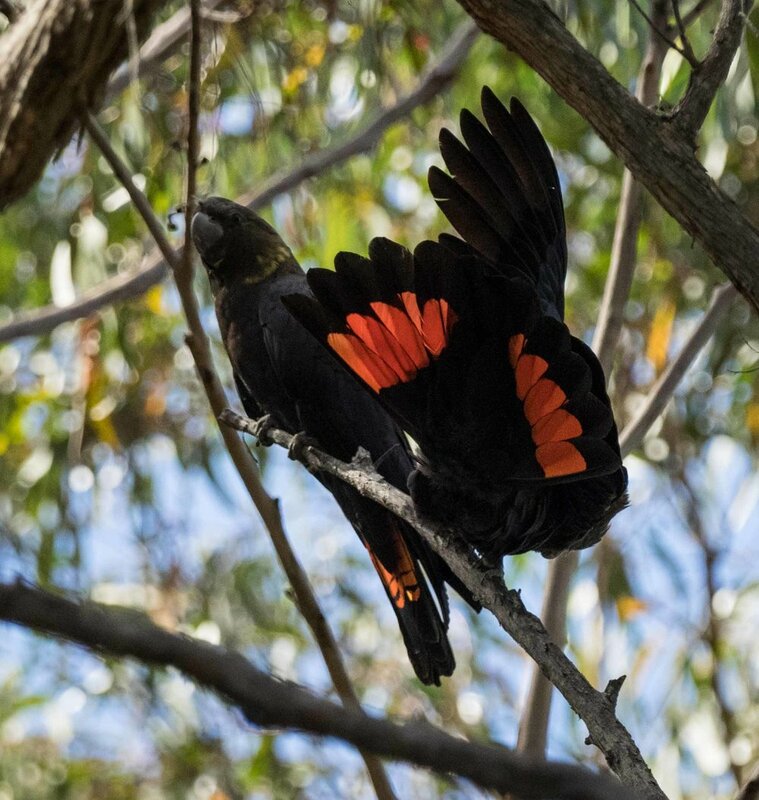 We typically know they're on site by their soft calls or the squeaking crunch of casuarina fruit as they feed. But yesterday's visit was even more special than usual. So that's the purpose of the head crest and brilliant red tail feathers! He put on quite a display, for his partner – and for onlookers. Glossy Black-Cockatoos 'mate for life'. That is, they are known to form long-standing partnerships with strong pair bonds. The 'mate for life' tag awarded to many species is increasingly being shown to be a rather human-centric view of nature. It is now recognised that even birds with strong bonds such as these cockatoos are constantly vigilant. Males guard their mates from other interested males, and even engage in mock copulation as a demonstration that the female is 'taken' - unavailable as a breeding partner for bachelor males. These partnerships can indeed last a long time. Glossy Black-Cockatoos live 20 years or more. It would be wonderful to think that this pair would select a tree hollow in our patch of forest, but we've currently no idea where they nest. It could be as much as 10km away, according to some descriptions I've read. For now, it is enough that we see them feeding here on occasion.